Manage Raws is a plug-in for Eye of GNOME, the GNOME image viewer. It provides a simple that aims to help you manage the many “raw” files that DSLRs, typically, save alongside the jpegs. These are often large and it is often impractical to keep them all. Manage Raws allows you to select, for each image, whether you want to keep the associated raw file and then delete the rest (move them to the wastebasket, actually). Raw files that you want to keep are simply moved to a raw subdirectory, which is created (and removed) as necessary. Manage Raws is written in Python and requires GTK 3 and GNOME 3.2. Manage Raws is free/libre open-source software, available under the terms of the GNU General Public License version 3 or later. To install, copy the contents of the src directory to your Eye of GNOME plugins directory. To keep a raw file, select the “Keep Raw File” option from the Tools menu (or press K). 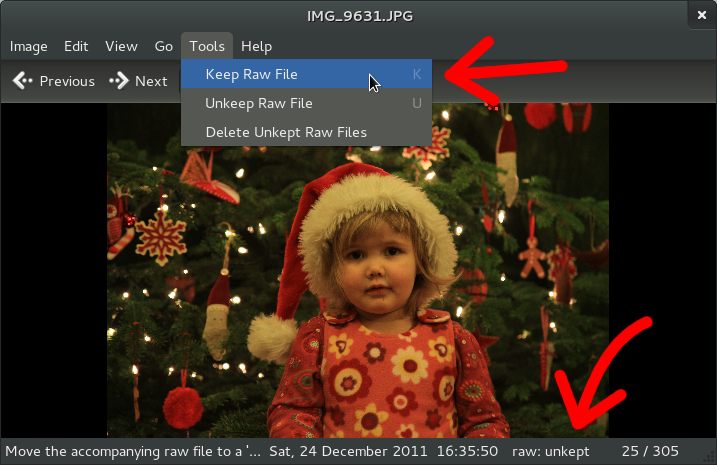 If you you no longer want to keep a raw file that you previously kept, select “Unkeep Raw File” from the Tools menu (or press U). Keeping a raw file creates a raw subdirectory (if it doesn’t exist) and moves the raw file that accompanies the jpeg that you’re viewing in to it. The raw files you want to keep are kept out of the way. Unkeeping raw files moves them back to the parent directory (and removes the raw subdirectory if it is empty). From the Tools menu, select the “Delete Unkept Raw Files” option. This moves any remaining raw files that have not opted to keep to the trash.